It's once again time for Project QUILTING. Kim at Persimon Dreams and Trish at Quilt Chicken host this series of one week quilt challenges running now through March. I participated for the first time last year for season 8. Each week there is a theme and exactly one week to formulate a plan and execute it to completion. This week's theme was Hometown Proud. There is a prize drawing for participants, and a Viewer's Choice vote, so be sure to visit the link up and vote for your favorites. (VOTING IS OPEN. Mine is #73.) If you haven't participated, consider joining us for round two which begins on January 21. I have lived my entire life in San Jose, California (with the four year exception of being in college in San Diego), so unlike people who had to consider which town they wanted to identify with for their challenge, there was only one choice for me: San Jose. I thought a little about what San Jose means to me, or what comes to mind. San Jose is a city with a population of over 1 million people. Santa Clara County has nearly 2 million people, and the greater Bay Area has a population of over 7 million people in nine counties and 101 cities. I live in the heart of Silicon Valley. There are a wealth of options to represent my hometown. I considered a few options, thinking about memories from my childhood. Here are a few I considered: Happy Hollow, Sharks hockey, Wichester Mystery House, San Jose Giants, Christmas in the Park, The Tech Museum, San Jose Museum of Quilts and Textiles, the 'Quake of '89, History Park, Hotel De Anza, San Jose libraries. In the end, I settled on the first item on my list: the orchards. Back before Silicon Valley was Silicon Valley, the valley was full of trees. Long before I was here, Santa Clara County had 8 million fruit trees. My parents built their house in the 70's along the east foothills surrounded by orchards. The vast majority of these orchards are gone. Heritage Orchard at San Jose’s Guadalupe River Park is 3.3 acres, containing over 200 fruit trees, of the varieties that were grown in the Valley over the last century. This map (PDF) of the Heritage Orchard was the basis for the design of my quilt. Each tree is represented by a 1/2" x 1/2" square. As you can see on the map, the first three sections of trees are cherries, apricots, and prunes. The last section of the orchard has a wide variety of fruit and nut trees. I chose a low volume black on white for the area around the trees and bound in the same fabric. All those tiny pieces create a lot of bulk on the back. My smallest pieces were cut 1" x 1" and finish at 1/2" x 1/2". The quilt finished at approximately 7" x 10" and has over 125 pieces. I shared a bit about my project with guild mates without telling my inspiration and a guess was made that all my little bits of fabric were to represent computer chips. From that conversation I was inspired by Michelle and Mary to use the design of a circuit board for my quilting. 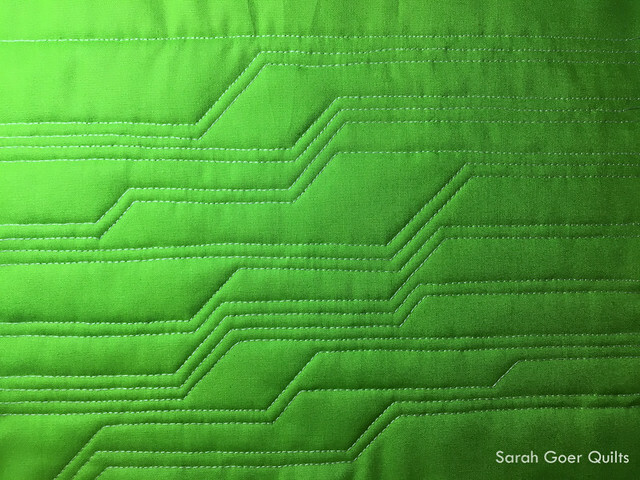 I used my hera marker to mark some horizontal lines as a guide for my quilting. It is quilted in Aurifil Dove (#2600) 50 wt. Also with circuit boards in mind, I chose a bright green solid for the backing. I thought these details were a great nod to the current Valley. I've named it Silicon Valley, Then and Now. Posted in Quilting. 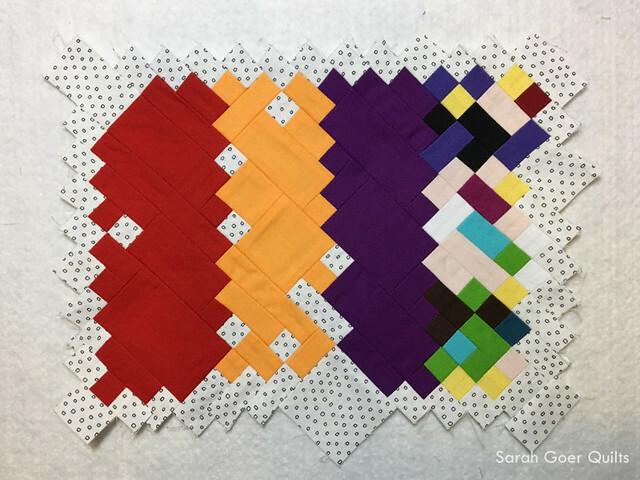 Tags: challenge quilt, finished quilt, mini quilt, Project QUILTING on January 14, 2018 by sarah. Sarah, I was intrigued by the design of this mini, and it made me want to know more about it. I loved you sharing the back story about all the long gone orchards in the Silicon Valley. And then the circuit board quilting to represent present day Silicon Valley. Brilliant!!! 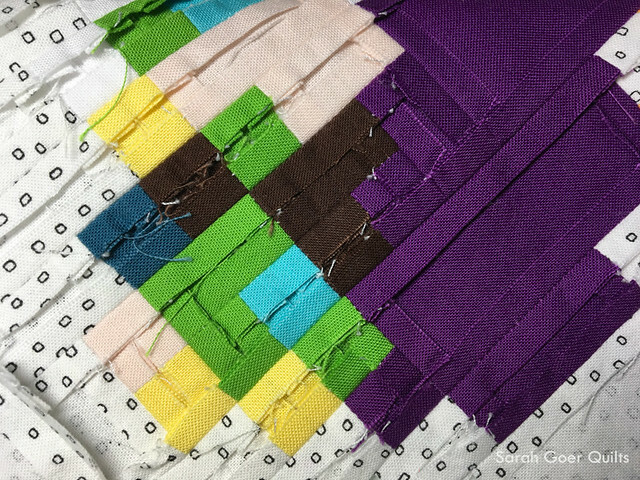 I, too, wondered about the circuit board as an inspiration and love the full story behind the quilt and detail that it represents! Mine isn’t the only Silicon Valley quilt in the bundle. Have you seen Mel Beach’s quilt? Thank you for visiting, Yvonne. I grew up in San Jose (Santa Teresa/Blossom Hill area) where there was an orchard right next to our housing development. It was so sad to see all that agriculture go away. Our friends were actually the last to have a dairy in San Jose (not the area where we lived). I would never have thought San Jose could be so pretty like your quilt - but it used to be. I moved out of San Jose in 1988 so a lot has changed there now. I don't know if I'd be able to find my way around anymore. Thank you, Barbara. It has changed so much since my childhood. Even though much of the orchards were gone there were still pockets of them here and there. Slowly, the orchards of my childhood, like where I bought cherries at a side of the road near my house, have been replaced with housing. I live on the other side of the city and the changes from where I grew up often surprise me. So much fun watching this piece evolve from inspiration to piecing (only 125 tiny pieces) to fabulous quilting!! San Jose is well represented!! Great idea. 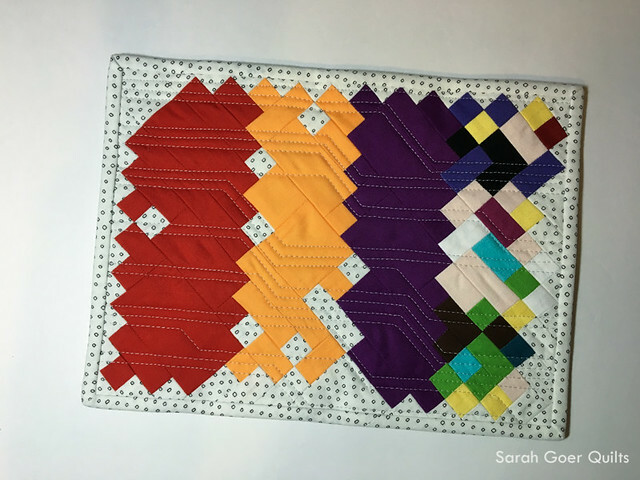 Love the history of your story and how you brought it to life in this quilt. Awesome!! That's a lot of tiny pieces. I also finished my project. Thank you, Anja. It sure is. I’d totally committed to the design before I counted the number of pieces so I was already all in. Since many of the seems were only one inch long it went together pretty quickly. ;-) I’m so glad you got yours finished. I just popped over and it looks great. Did you have fun? In for the next challenge? I haven’t had a chance to check out everyone’s projects. I’m impressed at how many there are and I’ll look at them over the next few days. This is such a great representation of Silicon Valley - I really love it. I also grew up there, in Los Altos. We had so many apricot orchards everywhere and now they are all gone. It is vastly different than when I lived there, up until 1981. I think your combination of the orchards with the circuit board quilting is so creative. Great job all the way around!! Excellent mini, such tiny piecing! I really like the quilting design you used too, it ties the colors together well. Thank you, Cheryl. I'm glad I came up with a fun quilting motif. 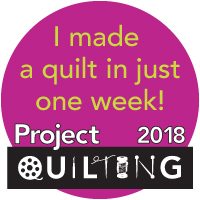 I had no plan for the quilting until the last day. Such a cool little quilt and the story behind it is great reading too. Great job!! Voted! Great job and I love that yours is pieced and seeing the underside in the progress photos. I'm hoping to join in and am sad I missed this prompt - I had so many ideas just not enough minutes in the day. What an amazing piece and story! I love your take on the challenge and the end result is truly beautiful. Thank you, Vera. And thanks for hosting TGIFF! A wonderful representation. Loved reading about it! I love seeing a quilt about San Jose. 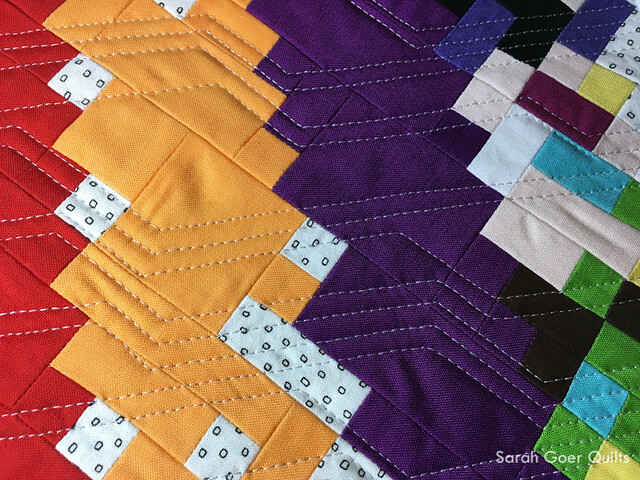 The colors are bright and the quilting is fantastic. Great job Sarah! Thank you, Peggy! 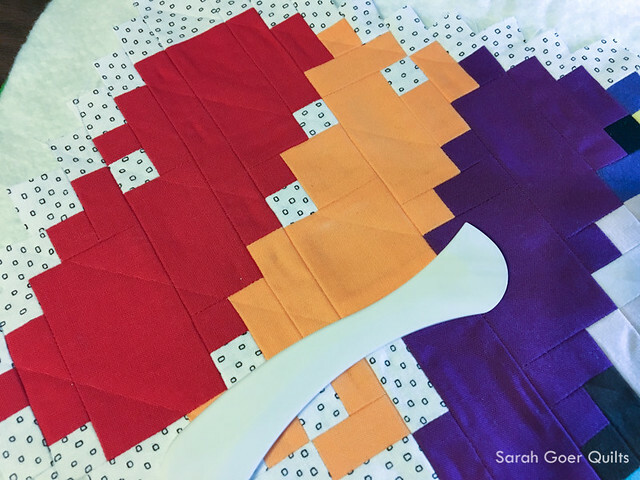 Have you seen Mel's Silicon Valley quilt for the same challenge?